UBC’s big tree registry aims to protect the province’s giants. 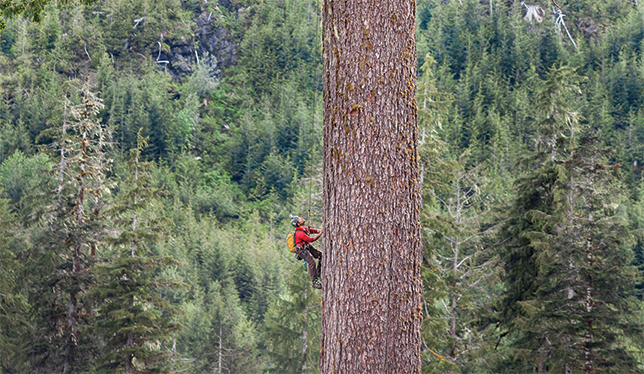 A professional tree-climber scales Big Lonely Doug on Vancouver Island in 2014. A group of professional tree-climbers dedicated to saving British Columbia’s biggest trees last year scaled Big Lonely Doug to measure its height. This coastal Douglas fir is so-named because it stands alone in a clear-cut near Port Renfrew on Vancouver Island. At 66 metres, or roughly the height of an 18-storey building, Big Doug isn’t quite as tall as the climbers had initially thought, but its combined height, circumference and crown spread still earned it fourth place for its species in the B.C. Big Tree Registry. The registry, initiated in the 1980s by outdoorsman Randy Stoltmann, changed homes several times over the years but since 2010 has resided in the faculty of forestry at the University of British Columbia. It is an important resource not just for statistical and scientific purposes, but also to make people aware of the existence of these big trees, says Sally Aitken, a professor of forestry at UBC and coordinator of the registry. “We don’t have that many of these massive giants left – a lot fewer than there used to be – and we need to find them to protect them. That’s certainly part of the motivation for doing this,” she says. Anybody can nominate a tree for inclusion in the registry, which records the biggest specimens of all tree species in B.C., from the mighty Sitka (record height 80.8 m) to the lowly choke cherry (10.7 m). Dr. Aitken credits most of the work to a small army of devoted big-tree hunters. The registry also relies on volunteer verifiers to accurately measure and record the details of any new finds. The committee members that run the registry “really feel that the biggest ones are still out there” to be discovered, she says.